Hey everyone! I’m Leslie Kay, the girl behind the blog DisneyBound! So, every year for holiday season, I bake these sugar cookies with my Star Wars cookie cutters from William-Sonoma! This year was a little different for me—as I am now gluten-free! In my house, we love to bake and with two of the three of us being GF, we’ve figured out a few tips and tricks to bake gluten-free. 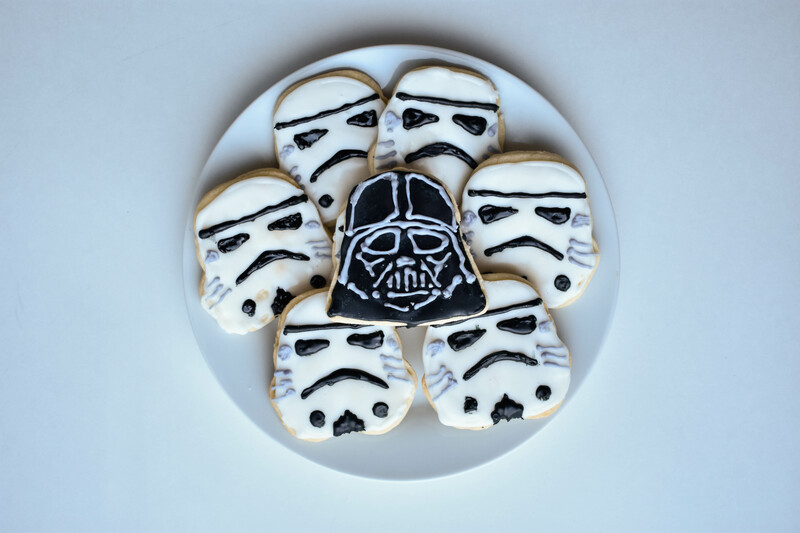 Here is my recipe for Gluten-Free Star Wars Sugar Cookies! 1. Mix together butter and shortening until blended. 2. Add sugar, baking powder and a dash of salt. Stir until combined. 3. Mix in egg and vanilla. Stir until combined. 4. Mix in coconut or almond flour. Stir until combined. 5. Divid the dough into two balls. Place in the fridge for an hour. 6. On a lightly floured surface, roll out the dough and cut with desired cookie cutters. 7. Place on an un-greased cookie sheet. 8. Bake in a 375° oven for 7 minutes or until edges are firm and bottoms are very lightly browned. 9. Let cool prior to icing. I used this video as a reference for my icing! Set aside a few cookies as “practice” cookies until you get your icing strategy figured out.